I am a mummy on a quest against eczema flare ups on my little boy who scratches till he bleeds. Unsatisfied with the temporary relief his prescribed steroid creams offered plus the potential side effects of prolonged use, I explored alternative solutions. We are now into our fifth week as Watercress Ambassadors trialing the use of watercress in my son’s diet. 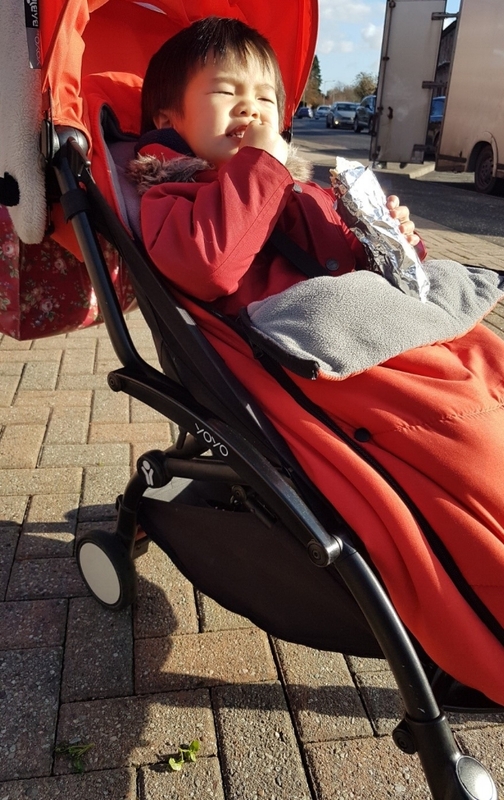 We had had to take an unexpected trip to Hong Kong where living in a hotel had meant home cooking was impossible and I suspect that the lack of watercress had contributed to the deterioration in my son’s skin condition. After our first week back from Hong Kong, our watercress journey resumed with gusto to undo all the processed food my little one ate. It was a relief to see his broken skin beginning to heal. Despite being back in cooler climes and with watercress back in his diet, my son was itchy for a couple of nights but luckily he didn’t break the skin with his scratching. The itchiness could be due to us having the central heating on; it was quite a shock going from 30 degrees heat to a cool 10 degrees! To fellow carers of eczema sufferers beware - central heating reduces humidity and dries the skin, making it itchy. In the bedrooms, turning off the radiators or setting the thermostat to 18°C will help prevent overheating and itching at night. People with eczema generally find radiators preferable to convection heaters, because they have less of a drying effect. Over the last six months we have been able to drastically reduce our use of steroid cream on my son. Along with his dietary changes we were introduced to a natural product for healing skin called Tamanu balm. The blurb from their website advises this is a multipurpose green balm which helps to repair scarred and damaged skin, and has a healthy, unique herbal scent. Also known as ‘green gold’ it is a remedy trusted for centuries in the Polynesian islands to stimulate skin renewal. It is blended with hydrating, soothing monoi oil and cocoa butters and contains antioxidant-rich blackcurrant extract and raspberry seed oil. Within 2 days of applying, any areas of concern cleared up and healed - it has been a brilliant aid. We have also replaced his daily moisturiser, Epaderm with Palmer’s Shea Cocoa Butter. The second week back from our trip to Hong Kong, we were all still jet lagged and struggling. Relax your schedule: If you’re someone with a rigid schedule at home, try to relax that schedule during the days before your flight. Having a rigid routine of eating and sleeping will make it harder to adjust to new time zones. Get a good night’s sleep before you fly: People often end up having slept for just a few hours before a long flight – whether it’s due to pre-holiday excitement or a deliberate attempt to tire yourself out so that you’ll sleep through the flight. Big mistake. Last minute changes to your routine will only make it harder to adjust to new time zones, and getting a good night’s sleep before your flight will leave you better equipped to cope with jet lag. Avoid arriving at night: If possible, opt for a flight which arrives in daylight. This will make it easier to stay awake – you’ll be much more tempted to get out and explore if the sun’s shining and you’ve got a full day ahead of you. Split up the trip: Try and build in a stopover, so your body has more time to adapt to the new routine. This can also slash the price of your airfare. Avoid the bar: tempting though it is to kick off your holiday with a pre-flight gin and tonic, the effects of alcohol at altitude will increase tiredness and cause dehydration, making it even harder to beat the inevitable jet lag. Sleeping pills are a no no: Relying on sleeping pills for long-haul flights is a bad idea. They’ll do nothing to assist your recovery from jet lag and will just leave you feeling fuzzy when you land. If you’re in need of some shut-eye, do it the natural way. Unlimited, free hot water is one of the best in-flight freebies, so why not bring your own herbal tea bags? Say goodbye to coffee: Avoid caffeine-heavy beverages such as coffee, cola and energy drinks. These artificial stimulants will affect your ability to sleep and increase jet lag recovery time. Your body functions best when it’s hydrated, so drinking lots of water is a great way to offset the effects of jet lag. Set your watch: When you get on the plane, set your watch to the time of your destination to get yourself psychologically aligned. Catch up on sleep: Try to get as much sleep as you normally would in a 24-hour period – make up any shortfall with a (short) snooze on the day of arrival if necessary. Back in the UK, my son’s dinners were still a challenge as a result of the jet lag. But, taking inspiration from a Korean barbecue meal we’d had in Hong Kong, I separately stir fried enoki mushroom, shimeji mushroom and watercress with oyster sauce. I lay the mushrooms down on the plate and placed steamed salmon on top. The dish did not resonate with my son - he wasn’t impressed - but his daddy enjoyed it! For dinner, I added stir fried watercress mixed through with boiled rice to a side of leftover egg foo yung from our family take away - this was a simple, quick and easy dish which my son enjoyed. For lunch I was short on time, so I made a quick “cheat meal” of ramen noodles. I didn’t use the packet of soup base that normally comes with ramen noodles, as I was worried about the salt content. So I simply boiled the ramen noodles, shredded some watercress and ham into the pot, before cracking an egg into the mixture too. Then I just strained and served. The fun noodles were a hit! For dinner, I tried boiled rice with turkey mince and watercress again. Last time I had made it there was no sauce and everything was very dry. This time, instead of steaming the turkey mince, I stir fried it with a little oyster sauce and served it with boiled rice with watercress stirred through it. Success! My son cleaned his plate, but mainly, I suspect as he loves the savoury taste of oyster sauce! Having had a busy day, I didn’t get a chance to re-stock the fridge, so I had to make something new and exciting with another tortilla wrap. I thought, what does he love? Pizza! 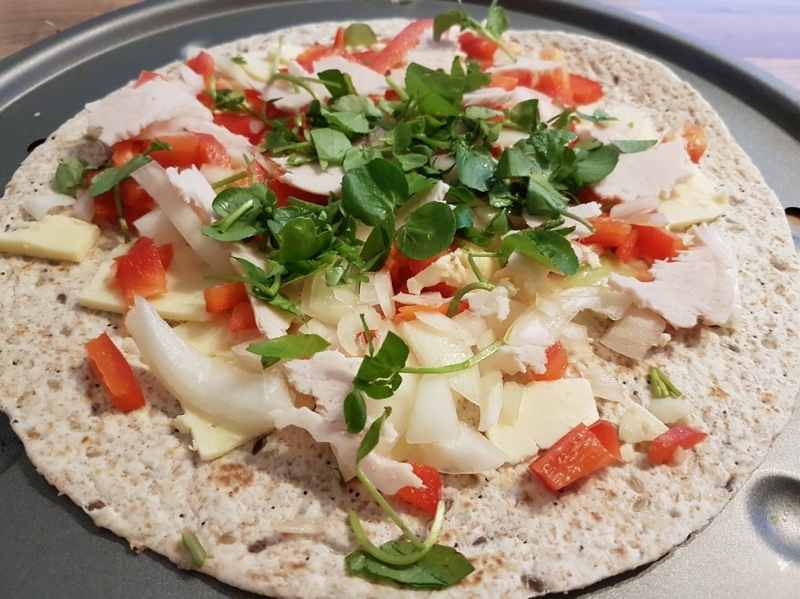 So I put a tortilla on a baking tray and layered on cheese, onions, diced peppers, sliced chicken and a sprinkle of watercress on top. The “pizza” was baked in a hot oven for 4 minutes until the cheese melted and the tortilla base had gone crispy brown. Much to my surprise, my son had no interest whatsoever; I blame it on the fact that he was tired and it didn’t arrive in a blue and red cardboard box! Towards the end of this week, our jet lag is beginning to subside. Hopefully it will have gone next week and I can drum up some new winning watercress dishes for my son in Episode 6. In the meantime, if you’re in the same boat, or are about to go on a long haul flight, try eating these foods to minimise the impact of jet lag. Oatmeal: To help reset your biological clock and adjust to a new time zone, you need to keep your insulin levels elevated. Foods that are rich in carbohydrates can induce insulin secretion, so if you're landing around breakfast time, choose a healthy source of carbs, like oatmeal. Quinoa: Conversely, if you're arriving around lunch or dinner time, you're going to want to carb-load as well, but keep it healthy by choosing a whole grain, low-GI carb, like quinoa, brown rice, or sweet potatoes. Ginger: Ginger is another source of melatonin, so travel with a few bags of ginger tea when adjusting to a new time zone. Bananas: Thanks to the potassium and natural sugar in bananas, you can get a boost of energy and help sustain your blood sugar if you're crashing. Chicken Breast: Your body needs protein, along with carbs, to keep your energy levels stable, but the type of protein you choose is key. Fatty proteins will drain your energy and make you sleepy, so stick to leaner meats, like chicken and fish. Watercress: One of the most important things you can do to beat jet lag is stay hydrated, so opt for hydrating, water-rich foods like celery, watermelon, strawberries, cucumbers and watercress.